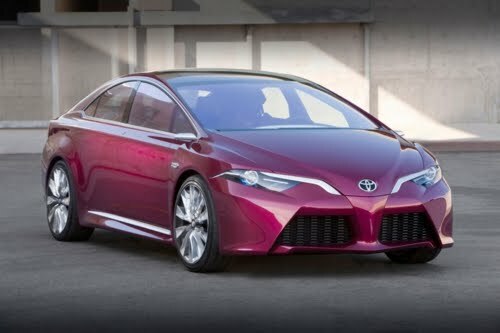 Toyota today revealed the NS4 advanced plug-in hybrid concept vehicle at the 2012 North American International Auto Show (NAIAS) in Detroit. The NS4 signifies Toyota's vision for future mobility with a focus on connectivity and the human interface. "In this digital age, cars are becoming another spoke in the wheel of our electronic connectivity," said Jim Lentz, TMS president and chief operating officer. "NS4 demonstrates Toyota's take on the human connection to the car with technology that considers both emotional and rational relationships, person-to-car and car-to-society." NS4's advanced powertrain targets a next-generation Hybrid Synergy Drive plug-in system featuring reductions in component size and weight with improved overall fuel economy, better acceleration and longer all-electric range, while maintaining a short charge time. The NS4 concept signals a new styling direction for the Toyota brand aimed at creating an emotional connection with consumers. NS4 styling lines reflect a new take on the aerodynamics of the modified triangle, with a low height and cabin-forward tilt. The distinctive open trapezoid grill is accented by a floating lower spoiler and wing-like daytime running lights wrapping around to a sculpted fender. Rear lamps wrap around the sides of the vehicle to quarter sections layered into blistered fenders, while the rear lamp wings create a sharp edge and the effect of a rear spoiler. crush integrity. The roof line profile, lift back design and powered swan-wing doors create greater accessibility and efficient functionality. The NS4 concept's Human-Machine Interface (HMI) provides a user interface built around a multi-touch screen with the look and feel of a smartphone. The simple, intuitive operation conveys information quickly while minimizing distractions and maximizing driver awareness. The multimedia and vehicle-controls enhancement also will direct air conditioning, audio, battery-charge and navigation functions. The HMI system is even capable of "learning" driver preferences and habits to anticipate driver responses in specific environments and situations. This concept represents a truly connected vehicle, offering the latest technology in a responsible and convenient package. The pop-up hood structure automatically raises the rear of the hood to increase the space underneath, helping to reduce pedestrian head injuries caused by a collision with the front of the vehicle, within certain speed ranges. This innovation is the result of testing and verification using both conventional crash-test dummies and Toyota's Total Human Model for Safety (THUMS) virtual model. "The continued success of our conventional hybrid vehicles has laid strong groundwork for market acceptance of future advanced technologies," said Lentz. "NS4 demonstrates Toyota's ongoing commitment to enhancing the safety, efficiency, and convenience of future mobility for people everywhere."